This sweet and savory recipe for Mini French Toast Sausage Roll-Ups served with warm maple syrup for dunking will be the best addition to your next holiday breakfast or brunch! Happy Friday, everyone! We made it through the week (I barely made it, let’s be honest). I’m going to keep it real for a second here and say I am normally not a breakfast person. Easter and brunch recipes go hand in hand and it’s going to be here before you know it! It’s time, folks. Time to start thinking about what you’re going to be making for the holiday and all of your brunch guests. Are you in charge of bringing a dish to a brunch outside of your home? I have some “Brunchspiration” for you today and this one is sure to impress, guys. If you’re like me, you don’t want to spend the morning pulling your hair out trying to make it all come together. More time with your family and friends is ideal, right? Right. I used Johnsonville Brown Sugar & Honey breakfast sausage in these Mini French Toast Sausage Roll-Ups to make things super quick and easy. They have a variety of flavors, but this one sounded the best to me! The size is perfect while still having the big, bold flavor of their regular sausage, the flavor is perfect….just, everything is perfect about their sausage. It’s the secret to a successful brunch or breakfast! 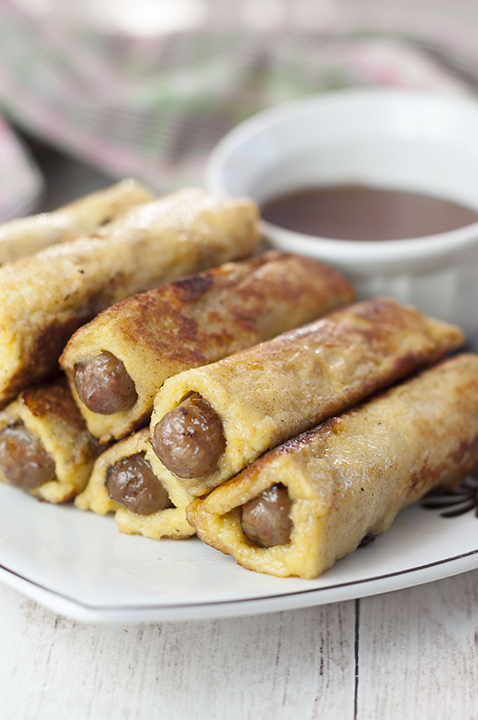 These Mini French Toast Sausage Roll-Ups are fun to make and fun to eat. 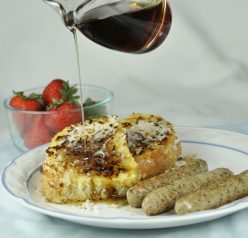 The brown sugar and honey sausages are wrapped in a sweet cinnamon french toast batter and dunked in warm maple syrup. It’s like French toast sticks with the added bonus of sausage links inside which makes them more filling and hearty. Sweet and savory is the best combination! And isn’t dunking something in syrup always exciting and appealing? Holiday brunches give us the chance to get creative with what to serve guests, so make something they wouldn’t expect this year! Kids (even picky eaters) are sure to love these. 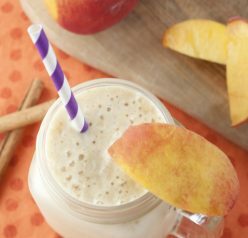 Don’t save this one just for Easter – this is easy enough to be made for your weekend breakfasts! 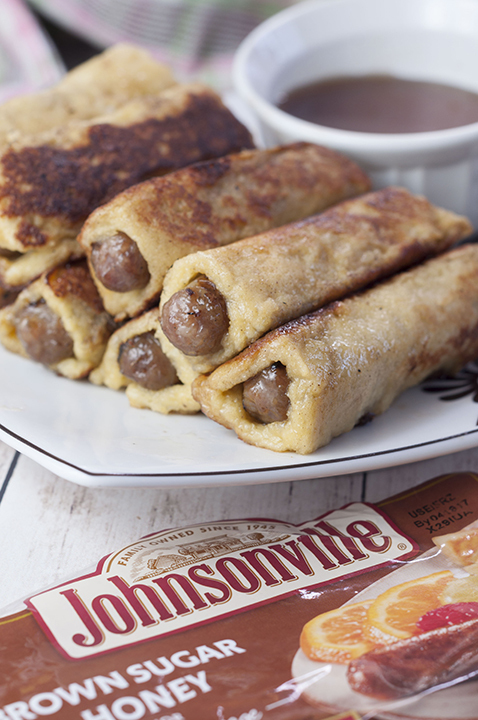 Using Johnsonville sausage is so convenient to work into your favorite breakfast or “brinner” dishes. Oh, and these Mini French Toast Sausage Roll-Ups are super addicting, so consider yourself warned. If you’re a fan of these, you might like my Coconut Crusted French Toast or my Banana Nutella Stuffed French Toast. 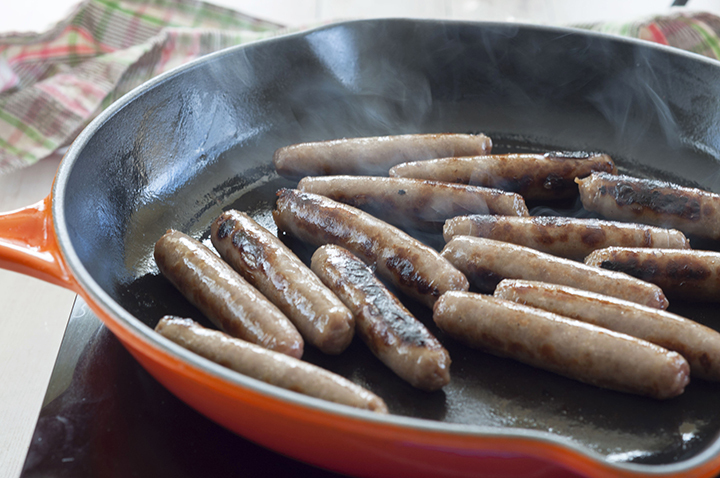 So, tell me, Wishes and Dishes readers – what is your favorite brunch recipe using breakfast sausage? I am always looking for more ideas! Check out my “how to” video on making these roll-ups! 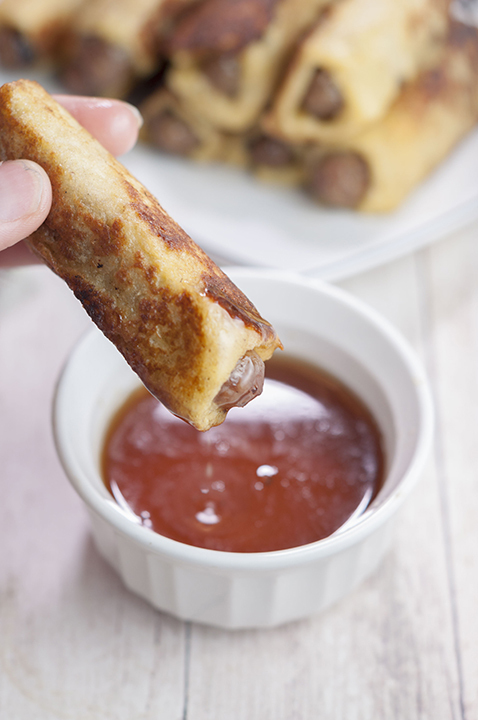 Sweet & savory recipe for Mini French Toast Sausage Roll-Ups served with warm maple syrup for dunking are the best addition to holiday breakfasts or brunch! Cook the breakfast sausages in a skillet according to directions on package. While they are cooking, trim the crusts off the bread slices and flatten them with a rolling pin. In a small mixing bowl, whisk together the eggs, cream, cinnamon and vanilla until combined.. Roll each sausage link up in one piece of bread and trim the ends off, if needed, to fit the sausage. If the sausage sticks out a bit, that's fine. Heat a skillet or non-stick pan over medium heat and add about a tablespoon of butter; melt. 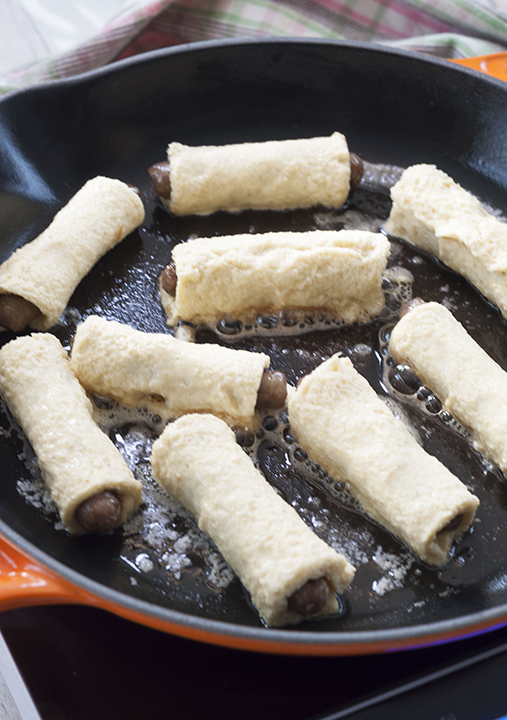 While butter is melting, dunk each sausage roll into the egg mixture, coat completely on all sides, let excess batter drip off, and place in the hot pan. Turn with tongs to cook on all sides. This will only take a few minutes. When each side is nicely browned, immediately remove from pan to prevent burning. Serve with maple syrup for dunking. Enjoy! These look amazing! My daughter is obsessed with breakfast foods AND anything she can dip, so this is the perfect morning meal. 🙂 Trying this ASAP! Why have I never had these before?? They are the cutest…and just how I like to eat sausage (encased in something). Yum! 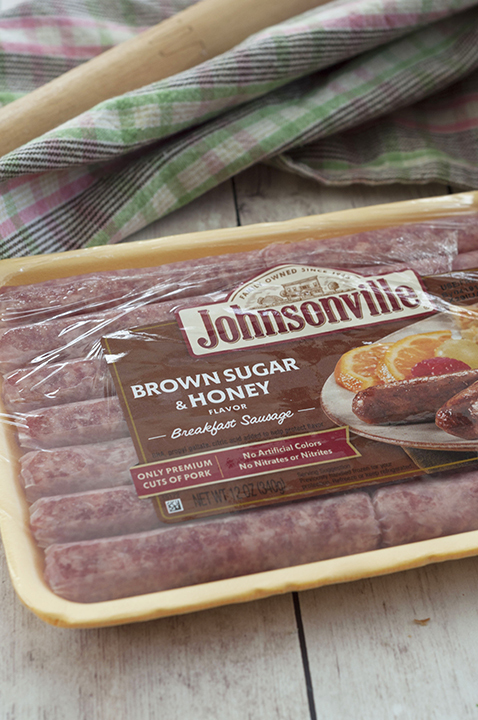 Johnsonville is the only breakfast sausage I buy! My daughter & were just talking about this for breakfast.. now we have a recipe!! Thank you! Oh! This is one we are going to have to try! The kids will love it! Oh my gosh! These are so much fun! Just love it. 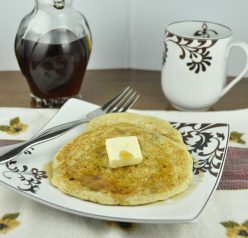 : ) I am a total morning person (sorry) so I’m ready to wake up early to make and enjoy these. I’ll motivate the fellas to get up on the weekend. haha! This is such a fun recipe! Perfect for brunch parties – like you said, when my mom and I are cooking for a party, we just want all the recipes to come together without all the usual fuss! This looks so easy and fun to make! I love how this dish combines two of my favourite breakfast items in a single tasty bite. I’m usually more of a savoury kind of gal when it comes to brunch, but french toast is the one exception to that rule… especially when there’s lots of warm maple syrup involved. Well, these look amazing. My kids would love them. I’m definitely going to have to make them! These look simply incredible! Perfect for guests! These look great. I’d love to be able to pull a few out of the freezer on busy weekday mornings. How would you suggest I go about freezing these? And how would I cook them once frozen? Can these be baked and frozen? Something I can make ahead and microwave to reheat.